We live in a society that constantly tells us what we lack. Would you agree that many, maybe most, of the articles and reports you see are about how to “do better,” “be better,” “get more” and “love life more”? With all that getting and needing and wanting . . . well, I just want to ask you one question. Mine, it runs from the Blue Ridge Mountains of western North Carolina down to the Low Country of South Carolina. And I’ll be glad to tell you a little bit—just a little bit—about that place. Because the place elicits books. But I’ll just let you in on some of the Insider secrets of it now. There are waterfalls galore. Transylvania County, southeast of Hendersonville, where the Pisgah National Forest begins, near the mouth of the French Broad River—well, there are more than 100 waterfalls right there in Transylvania County alone. Big ones, little ones, little ones behind bigger ones, icy cold clear mountain water rushing down steep rocky slopes called escarpments, enmeshed in lush green branches, moss and mountain laurel. Oh, and my friend since 4th grade, Mossin’ Annie, lives nearby. She is a true moss expert who grows moss and installs moss gardens near and far, keeps a large moss greenhouse and dresses exclusively in purple. You’d love her! Everyone does. She just finished a book on mosses for The New York Times. They love her, too. Down in Moore County, NC, people have been making pottery for 8 and 9 generations. Not trained in college or art school, for more than two centuries these true craftsmen and women learned at their parents’ knee and pottery wheel. The craft began there because the natural clay soil of that particular county in central North Carolina was perfect for making the craft that the settlers in 1740 brought from the Staffordshire region of England where they emigrated from. You know Staffordshire—where English bone china has been produced since the 1600s. A little background. Before the glass jar industry took over the food storage industry in the early 1900s, food was stored exclusively in pottery. All food. Food to eat that night and food to eat during the winter. Pottery was a necessity if you wanted to eat throughout the year. 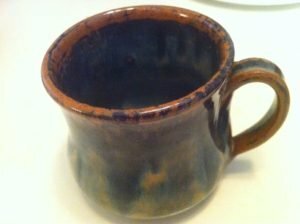 These days the pottery made in Moore County is largely decorative but its lineage is one of necessity. Plates, platters, storage jars for food and drink were just some of the uses of central NC pottery that was shipped as far away as New York City. And more likely than not, the few current remaining potters from potting families learned at college or the local tech college which now has a pottery certificate—though some, a few, probably did learn from grandparents or great-aunts or great-uncles who learned from their parents in the tradition of the region. The area now is home to more than 100 working potters who’ve moved there to be part of a longtime culture of potters. Some are better than others. And it’s impossible to visit all of them. But going to see and meet the best ones, or the ones whose work you might really love, is a unique treat, something you won’t find just anywhere. I first started visiting the potters in Moore County when I was in college. There were only about 5 working traditional potters left at that time. But one lady caught my attention. She was an amazing person—so rural yet so well-read. She thought we college folk from the university at Chapel Hill were a bit snooty and let us know it every once in a while. By mentioning something she’d read in the New York Times that Sunday (the New York Times??!!??) Or very calculatingly dropping the name of a UNC professor we’d likely know or mentioning a famous person–a musician or writer–who’d recently driven down the dusty road to stop at her wooden sales building. Watching her in her in her dark and very dusty, glaze-splattered workshed, a few steps from the sales building, was watching an inspired artist at work. As she attached a handle to an unglazed pitcher or formed a bowl or mug from a lump of clay. Zedith became like a surrogate mother to me, a one hour drive away, not the four hour drive away where my actual mother and father lived. I went there many weekends. I even brought her a miniature poodle puppy, a brother (from another litter) to my own black miniature poodle Fritz who often accompanied me on my drives there. One morning in my senior year of college, Zedith’s son called me at home to tell me something. And I just had to sit down. Zedith had died the day before from an aneurism. Her death came unexpected, at an early age, 47, though she looked much older from hard work and cigarettes. Her family’s culture, though, the pottery region of Moore County, North Carolina, is one I’ll always remember and love to visit again and again. At the coast of South Carolina, just below Myrtle Beach, across Route 17 from Murrell’s Inlet, along Waccamaw Neck, you’ll find Brookgreen Gardens. OMG, the grounds there and the statuary are beyond compare. There are 9100 acres of wildlife preserve, sculpture gardens and flower gardens. With trails meandering throughout the landscape and Cushman carts to take people who have difficulty walking, it’s a place you’ll feel happy to get lost in. I adore it! And it’s always on my list for vacationers who ask me for the coolest places near coastal South Carolina. What they get here is something different, gorgeous, uplifting and really just plain “beyond compare.” I know. I’m gushing. But let me tell you a little bit about it. Brookgreen opened in 1932. Owned by the step-son of a railroad magnate and his wife, Archer and Anna Huntington, it’s now home to more than 1400 sculptures sprinkled throughout the landscape. Anna was a sculptor and so was her sister, and they displayed their work there along with the work of other American sculptors. Before the Huntingtons bought it, the property had been four South Carolina rice plantations. I’ll bet you never even thought that rice was grown in the American south. When I learned that about the gardens, I remembered something about southern rice growing. But I never put two and two together to even think about what Brookgreen had been before it was Brookgreen. So many things are like that. We never really consider what had been there before. It was March when I first went to Brookgreen, and the flowers in bloom were gorgeous. Because that coastal area is temperate, it’s pretty much guaranteed that any time of year you go, there’ll be amazing flowers at peak color. I went there that first time with my Cousin Lois, my dad’s first cousin, one of my favorite relatives. She was the incarnation of Maude, the “mature,” brazen, gutsy, outspoken character from the tv show called Maude that Norman Lear created. At Brookgreen, Lois was feisty, as always, but she couldn’t walk so well then because of a recent knee replacement. She rode in a Cushman cart around the paths for a little while, then told me to explore as long as I wanted, that she’d be in the welcome center. So I did. I’ll always remember the trip I took with Cousin Lois, showing her the jewels of the Low Country, Brookgreen Gardens among them. All along the coastal region from Wilmington, NC, down through South Carolina and Georgia, all the way to Amelia Island, Florida, there are more than 1000 small islands where a near-lost African culture still abides. These islands are called the Sea Islands, and they still house, on the inhabited islands at least, folks who are descendants of slaves brought to those islands to work the indigo plantations before the Civil War. Indigo is a plant that provided a gigantic financial reward for the landowners. It’s the only plant that makes a pure bright blue dye and in the 1700s-1860, it was very much desired for clothing color. It was the only way, before artificial dyes were invented, to get blue clothing. So it got shipped back to the textile mills in England and it was expensive! You’d have to read a bunch of books about how much of the original African culture has survived among the slaves and their descendants, but in short, there are still places to go to see Gullah crafts like sweetgrass baskets, eat Gullah foods like redfish or Frogmore Stew, and hear the Gullah language spoken. And some of the B’rer Rabbit tales are based on Gullah stories. Isn’t that cool? I learned about the Geechee-Gullah culture when I was a college kid and during summers I worked at the Grove Park Inn in Asheville. The restaurant there where I worked no longer exists, but back then almost all the other workers were part of a circuit of workers who spent the summer and fall working at GPI, which was not winterized at that time. So it closed for the winter. Those workers would then travel to Charleston, SC, to work at the Francis Marion Hotel for the winter. The two hotels were both owned by the same Jack Tar chain of high end hotels back then. There was this one little tiny waitress who worked with me in Asheville, Tina was her name. She told me one time, “I’m a Geechie Girl—I bet you don’t know what that is, do you?” I said no, and she told me just a little about the food and mostly about the language. She said something in the Gullah language and I stood wide-eyed, not knowing a word she said. Something like: “Enty duh dem shum dey?” (Aren’t they the ones who saw him there?) Or “Dem yent yeddy wuh oonuh say.” (They didn’t hear what you said). I’ve always remembered her and still think of her and all the workers I got to know those two summers I worked there whenever I’ve been back to visit the Grove Park Inn. That social system of workers traveling on a circuit hasn’t been used at the GPI in more than 30 years, not since the Inn winterized in the mid-1980s and began staying open year-round. But I always think that maybe I’ll run into Tina or one of the other people I used to work with when I’m in Charleston or somewhere near there. Are you getting my drift now? Where are you from? What’s life like for you? These questions begin many meetings, workshops and break-out sessions at conferences, especially if they’re the “woo-woo” kind. You know, the kind that’re close to the psyche. That IS the most desired aspect of life that we often feel we’re missing out on. I just told you a little bit about my place, a region that stretches across 2 states from mountains to the sea. These places mean something to me. They’re tied to experiences and people that mean or meant a lot to me. Most of these places I know about in my extensive, almost encyclopedia-like, list of places I recommend to people who want amazing vacations in the Carolinas, mean a lot to me. So . . . tell me about where you’re from. What’s it like? What’s really cool there? What really grabs you in your heart, your gut? What would get your Travel Glow going if you actually weren’t from where you live? Or you could tell me about where you grew up. Sometimes that place stays with us more than where we live now. Either way, I’m really interested. What place(s) really mean something to you? I welcome comments. I really do. I’m Jan Schochet and I match people’s travel with their passions when they visit the remarkable Carolinas–North Carolina and South Carolina. Travel really can bring you closer to a sense of place. If you want to connect with a place that will be special to you, click here to learn how you can get made-for-you travel plans that will allow you to connect with your passions and provide you with a sense of place. I just want to create moss gardens and not worry about how to survive.